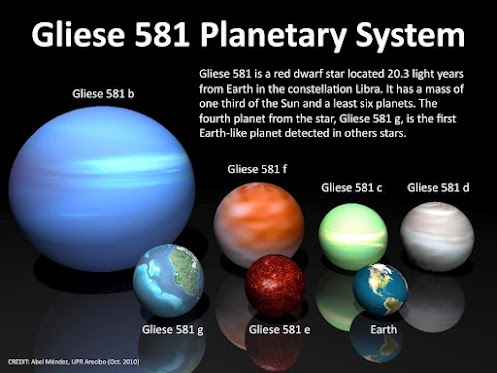 Gliese 581g Planet Most Similar To Earth. Astronomers have discovered the planet Gliese 581g.This Planet is 20.5 light-years from Earth in the constellation of Libra.It is the sixth planet discovered in the Gliese 581 planetary system and the fourth in order of increasing distance from the star. The discovery was announced by the Lick-Carnegie Exoplanet Survey in late September 2010. Gliese 581g has a mass about three to four times Earth,making it in all likelihood a rocky planet, rather than a gas giant. The planet is tidally locked to its star which means that during its 37 day orbit, it always shows the same face to the star so that one hemisphere is always in daylight while the other is in permanent nighttime. The planet’s surface gravity is expected to be in the range of 1.1 to 1.7 times Earth’s, enough to hold on to an atmosphere likely to be denser than Earth’s.Here the surface temperature is neither too cold nor too hot for the existence of life. SO WHAT DO YOU THINK ARE WE ALONE IN THIS UNIVERSE ? Previous article Teddy Bear Killed More People Than Grizzly Bears. Next article World’s Most Expensive Coffee Made Of Civet Cat Droppings. Teddy Bear Killed More People Than Grizzly Bears.